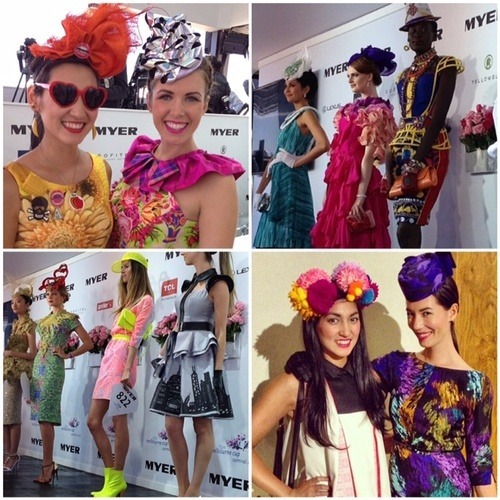 Melbourne Cup… the day that really does stop a nation. An opportunity to dress up and get into the spirit of the day. Always keen to prepare and plan ahead, I popped into Charlie Brown at Claremont Quarter for my Cup Day look. An edgy, colourful outfit was sorted in 30 minutes flat! Speed styling! Big thanks to Charlie Brown CQ Manager, Kirra Jarvis. 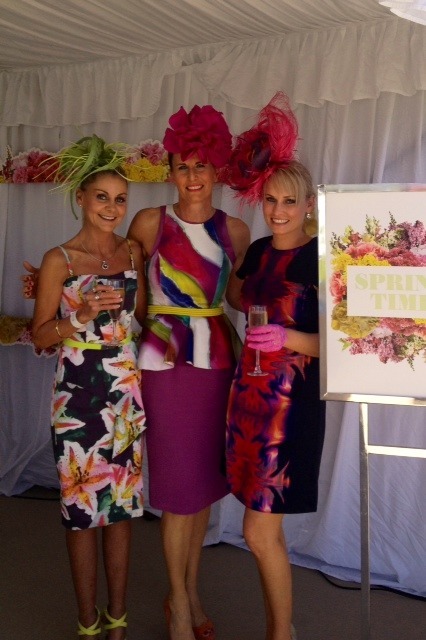 For the past 3 years my FOTF Ascot Race Day judging role has meant my Race Style has been strictly by the book!! Classic, ladylike, elegant style was an absolute must. 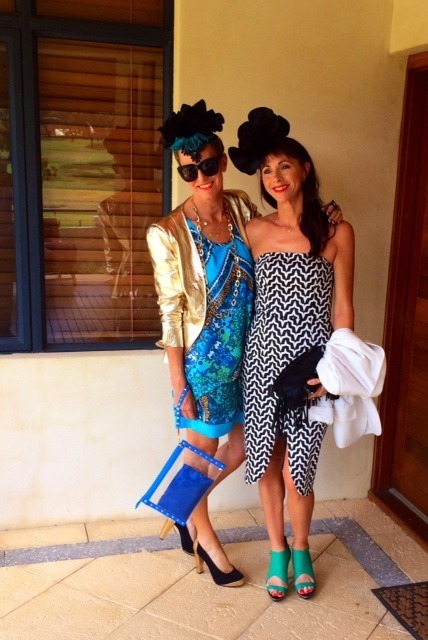 This year though, Cup Day spent with friends, meant a more relaxed style was acceptable. Yes… I did break ALL the rules!! …Noelene Paul. 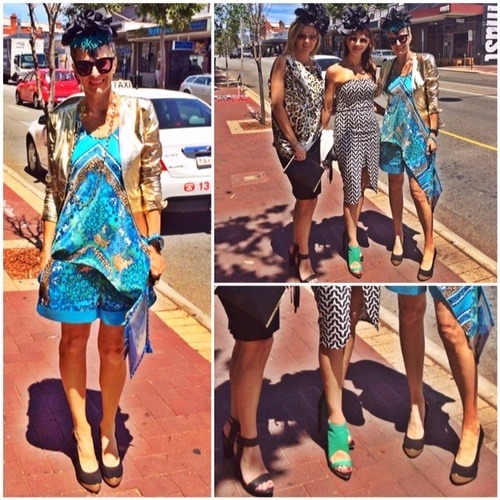 Noels rocked animale silk by Carla Zampatti from CQ. My Look! The Charlie Brown ‘Trouble Maker’ shorts were playful and fun. Shorts are NOT Race Wear, but dressy shorts are sooo comfy and practical to wear! 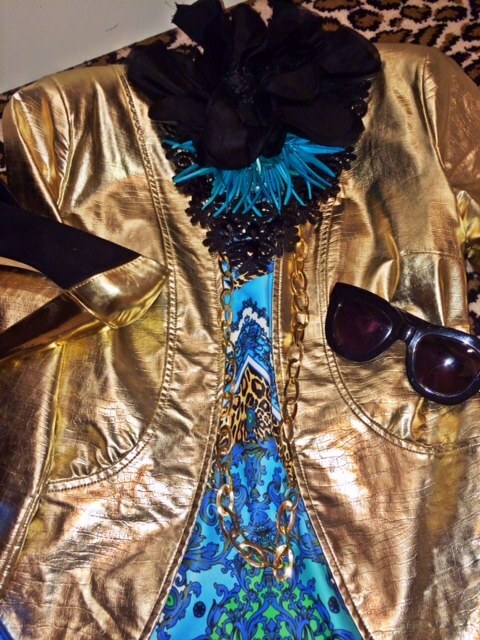 The metallic ‘Gold Digger’ jacket was lightweight and added glam to the look! The ‘Car Fountain Blue’ assymetric singlet was loose and knee length on one side. The fascinator was an AndAndrea creation. Shades by Karen Walker and suede/metallic heels (comfort plus) by Leona Edmiston. 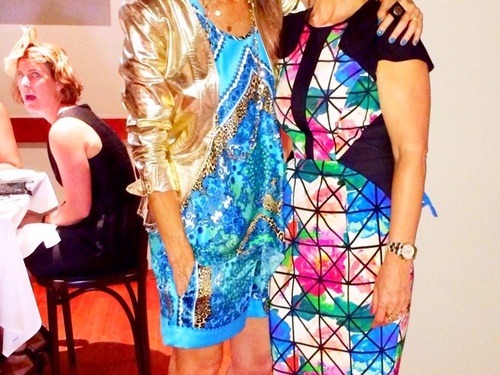 Inside ‘MUST’ Wine Bar we met up with glamsters Mattie Fares, Emma Milner and Wendy Mason. 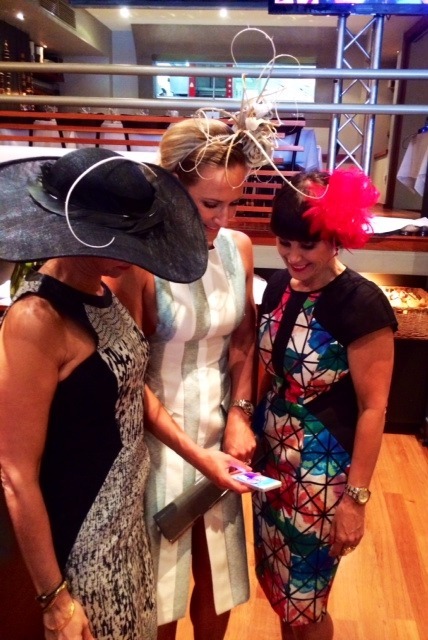 Emma (Centre) wore and Ellery shift and Reny Kestel leather headwear. Mattie and Wendy both wowed us in Ginger and Smart tunics. 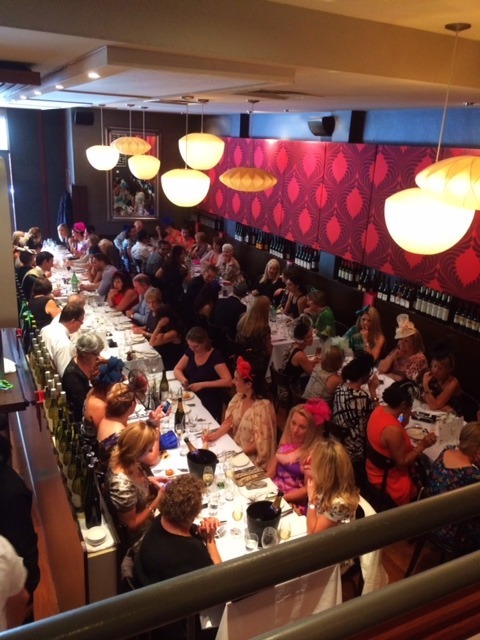 ‘MUST’ Wine Bar in Mt Lawley, was overflowing with well dressed Cuppers. Not a spare seat in site! A little colour pizzazz! Charlie Brown meets Ginger and Smart. Wendy Mason, from Harry & Gretel and her daughters Heidi & Brittany, along with h&G gals, Ash and Sarah (above) hosted a ‘MUST’ Cup Parade. 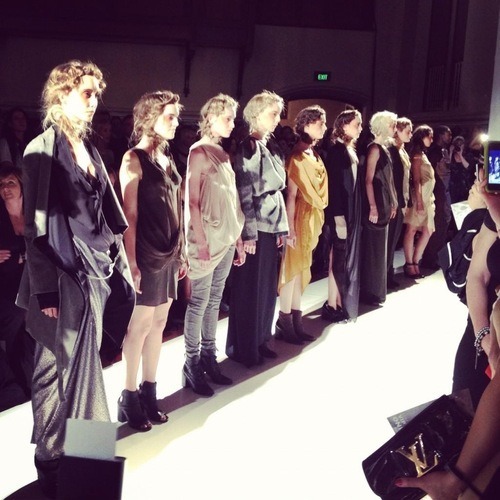 The models (bottom R) wore a mix of streetstyle, cafestyle, classic shift dresses, edgy cropped tops, cool floaty maxis and all-in-one pantsuits. Black and white featured! It was a fabulous MUST Cup Day and by 6pm it was time to head home. Once home, it’s time to see what’s HOT at Flemington. Looks ranged from spring florals, to monochrome, to touches of flouro. Peplums and structure won the day. Standout Style!! 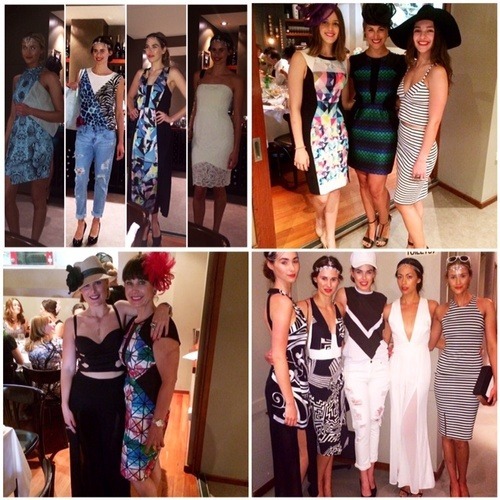 Some AndAndrea Fashion Forward Cup Moments. The ever fabby Richard Nylon in a Mickey Top hat, Lindy Klim in Dolce Gabbana, Dita von Teese in Costarella and model Rowena in Anthony Capon gold leaf.